Author Musa Gumede with is Detlev Diegel who runs the Bat Centre’s Dancing Pencil writing workshops on Saturdays. 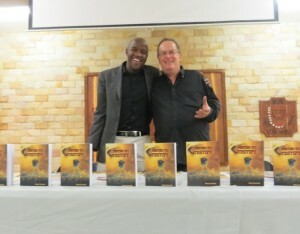 On Saturday the 1st of June, Musa Gumede launched his book, Tested to Testify, at St Martin de Porres School, 21 Aiken Street Port Shepstone. Present were two South Coast newspaper representatives as well as Ugu radio and South Coast Tourism.Musa’s old headmaster Mr Ray Cele of Mdlangaswa High School was also present. He was delighted to see the fruits of his educational institution in the good work of Musa, in writing a motivational book which would be of value to many people. Musa is intending to have this translated into isiZulu and recorded on a CD. Those present also suggested a road show for Musa and his book. Musa Gumede launched Tested to Testify in Durban at the SABC on Sunday 7 April 2013.